I love to walk MacRitchie Reservoir, a nature reserve in the middle of the island of Singapore and the country's version of Central Park. It is the nation's lung, a green forest amidst the city's high rises. Right now, though, Singapore is stinking hot with some unseasonably high temperatures. Walking under the trees offers respite from the sun but you're still a sticky humid mess when you come out of the forest canopy and back to the park entrance, so it is particularly delightful that right across the street is where you'll find the majority of Singapore's florists. I always go home with a bouquet. When you're dripping with sweat there is nothing more sublime than to push back the heavy hanging strips of plastic that trap the cold air, walk into the chilly space of the refrigerated floral rooms and be hit with the scent of the montage of mingled flowers. Some perfumes try to create the effect of opening the florist's refrigerator and the chilled smell of mixed bouquets. The smell is different than that of flowers unfurling in the sun and the sinuous release of scent. Flowers in the freezer greet you with a rush of scent but it is chilled and contained, not unfurling and blooming. Here in Singapore you will find roses, peonies, lilies, narcissus, hyacinths, carnations, and above all, loads of orchids. Orchids are to Singapore what roses are to the States. Here are some of my favorite perfumes that evoke the florist's fridge smell. This perfume was introduced in 2002 as a flanker to Estee Lauder's popular Pleasures perfume. Pleasures is supposed to evoke the smell of flowers after a rain but I always found it pale and uninspiring so I can't remember why I tried the flanker version back in 2002; probably because there were so few perfume releases then compared to today so the variety was welcome. For me this flanker far surpassed the original Pleasures and I don't see any resemblance between the two. Estee Lauder Pleasures Intense is well named because the initial burst of smell is indeed intense with its exhilarating scent and it always makes me smile. I get a cold rush of mixed florals and somehow that chilly refrigerated aura is translated into the perfume. Notes are peony, green lily, jasmine, tiare, and ylang ylang and at the beginning of the perfume's scent journey there is that jumble of florals. But in short order the peony takes the lead, followed by the green lily. These two flowers dominate as time goes on but they retain that feeling of refrigerated sharpness. I would assume that Pleasures Intense may have been meant to be a limited edition, as it was followed in subsequent years by Pleasures Exotic, Pleasures Delight, Pleasures Bloom, and this year by Pleasures Aqua which I'm afraid to try because of the name. I am certain that there were years when Pleasures Intense disappeared from the shelves, and when I used the last drops from my bottle about three years ago I was sad to finish it. But then I suddenly noticed Pleasures Intense quietly being listed on websites again, then eventually finding a place back on the display shelf in the store. I don't know the story of how this happened but would assume there were enough customers like me who mourned its passing that Estee Lauder decided to bring it back. This is a strong floral scent for the first couple of hours wear and I find it is one of my more complimented scents. Acca Kappa is an Italian brand first established in 1869 in the city of Treviso and known for body and wellness products and professional brushes. Their current line of perfumes started in 1999 with the purpose as stated on their website of providing "a world of sensory and olfactory experiences inspired by the fragrances of the flowers and plants found in Italian gardens." The line is readily available in Europe and Asia but the only US outlet I could find is in Las Vegas. Calycanthus is a deciduous shrub with burgundy colored highly fragrant flowers that bloom from late spring through summer and it is common in Italy. In the States it goes by the name spicebush or sweetshrub. I have never smelled this flower so I have no point of reference. On first application the perfume has a strong smell of spring flowers and it comes across as sharp and chilly. Touches of green help give the scent that fresh out of the freezer feel and gives the illusion that you are smelling a bouquet of fresh flowers with green leaves, stems and all. 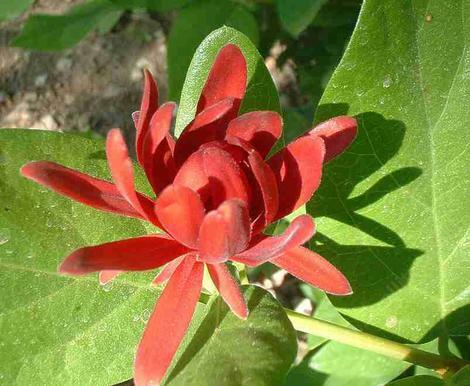 In addition to the calycanthus listed notes include jasmine, neroli, peony, bergamot and cyclamen. The feel is of a highly fragrant mixed bouquet with no one note dominating. It smells very fresh and invigorating. As the perfume wears it slowly loses that fresh from the freezer feel and notes of honey, peach, orange blossom and musk give it a warm dry down. As stated, I don't know the scent of this flower but if this perfume is an accurate representation than it must be lovely. I am old enough to remember when carnations actually had a smell, and it was beautiful in its soft, powdery and very distinctive sharp scent. Back then florists didn't have the abundance and variety of flowers available today, at least in Texas, and bouquets that I remember seemed limited to carnations, roses and daisies. Today the carnations I see for sale in buckets in my grocery are sadly scentless and thus have lost their main appeal. Fleuriste brings back that lovely memory of opening the refrigerated door and being engulfed in that exquisite smell of fresh carnations. Dawn Spencer Hurwitz has a way with carnations. One of my favorite carnation perfumes is her Oeillets Rouge, an interpretation of red carnations but a spicier, deeper perfume. Fleuriste doesn't wear like a perfume. Imagine opening the refrigerator door and grabbing a huge bouquet of red carnations, burying your nose in their damp coolness as you are overcome by their fragrance. This is Fleuriste. Dawn is very good at giving a short synopsis of her own perfumes and she says it well here: "Fresh and cool, dewy and spicy; Fleuriste is a scent of green rose leaves and chilled carnations straight from the florist's fridge." This scent differs from the other two mentioned above in that it wears more like a soliflore carnation bouquet, but it does retain that straight from the fridge chill and freshness. For me Fleuriste brings back beautiful scent memories of bundled carnations I gave to my mother on long ago Mother's Days. Happy Mother's Day to all the Moms. If you're lucky enough to still have a mother in your life go to your closest florist fridge and give the woman a bouquet! Or better yet, perfume. I would have liked to have included Smell Bent's Florist Fridge in this review but couldn't get a sample in time. Top two photos my own. Calycanthus phto from www.laspalitas.com. Carnation photo from www.theholidayspot.com. Samples my own. Just a week ago walking by the entrance of one of my favorite flower shops my vSO and I discussed how great and distinct the smell that was coming out of the door was. I didn't even think or read before about perfumes capturing that smell. Very interesting! Thank you. 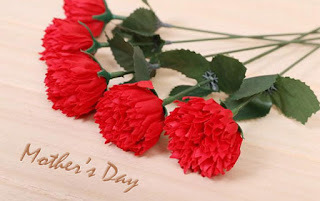 If it's your holiday, Happy Mother's Day to you!